At the beginning of the year, the 52 Week Dollar a Week Challenge was making the rounds with a lot of people deciding to give it a try. 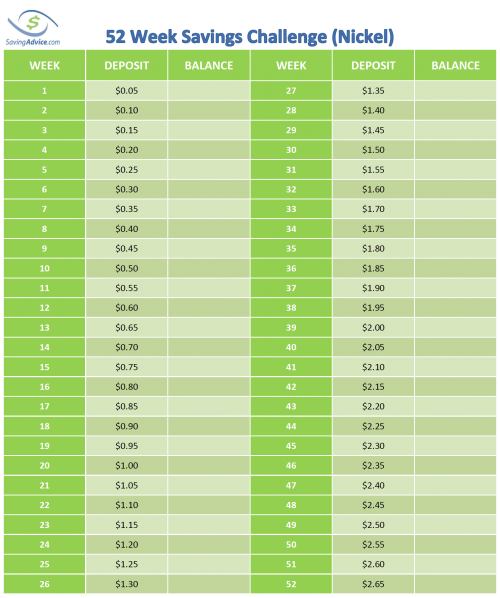 We took that and adapted it into a 52 week savings challenge which gave people a bit more flexibility in hopes that more people would stick with it. Both are a great way to get yourself into the habit of saving money on a weekly basis, and a wonderful way to put together your first emergency fund. After thinking about this for a while, it became apparent that it would also make an excellent teaching opportunity to help children save small amounts on a consistent basis over a long period of time. With this in mind, we have created four new challenge sheets specifically for kids. These work the same way that the original 52 week challenge sheet works, but use coin denominations for the weekly amount to be saved instead of a dollar bill. Each week for a year-long period, a coin should be saved with an additional coin added each week. The Quarter Challenge uses quarters instead of dollars, starting with a single quarter and adding an additional quarter each week of the year. 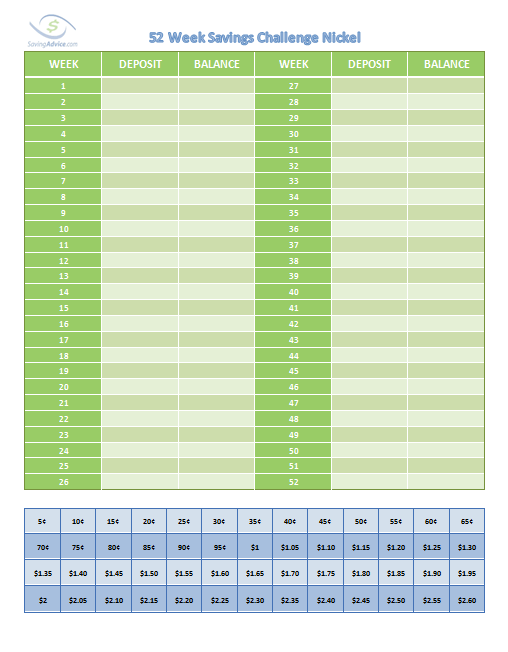 This means that on week 52, you will need to save 52 quarters, or $13.00 which is the highest amount on the chart. Children who are able to cross off all of the 52 amounts will save $344.50 over a year period. This is a great challenge for older kids who are starting to earn money on their own doing work here and there, as well as those who have their first real job. You can click on the image above to get a bigger version or you can download it here (PDF) to print. In addition to the standard version, we also made a flexible version that allows you to choose which of the 52 amounts you save each week. In a lot of ways, the challenge is similar to playing the game Yahtzee which should appeal to kids. There are 52 amounts corresponding to each week of the year at the bottom of the sheet. The goal each week is to save the highest amount still available, so in week one, your child would shoot for saving the $13.00 so that it can be crossed off. Saving the highest amount probably won’t always be possible. That’s OK. When this happens and the kids can’t save the highest amount still available, they do what they would in a game of Yahtzee. They would still try to save as much as possible (get the best score in Yahtzee) and then cross that amount off the sheet. The ultimate goal is to cross off all the amounts on the bottom of the challenge sheet over the course of the year, so that the child has saved the amount that sheet has as its goal. This way when there is a tight week and not a lot can be saved, a small amount can be crossed off while on weeks where a lot can be saved, the larger amounts can be marked off. The result is still $344.50, but there is a lot more flexibility in the amounts saved each week compared to the standard version. Again, to print you may click on the above image to get a larger version or you may click here to download a PDF version. The Dime Challenge uses dimes as the basis of the challenge, with an additional dime added each week of the year. In this challenge, children who are able to cross off all 52 amounts will save $137.80 over a year period. This is a great challenge for all children who have their eyes on a certain toy with a $100 price tag. It’s also good for kids who are just beginning to earn a little side money doing odd jobs here and there. If you would like to print this dime challenge, you can click on the image above or you may download the PDF version here. We also have a flexible version of the dime challenge if this has more appeal to you. Click on the image above to enlarge or download it (PDF) and print. The Nickel Challenge is great for kids who understand the concept of money and are just beginning to receive an allowance. 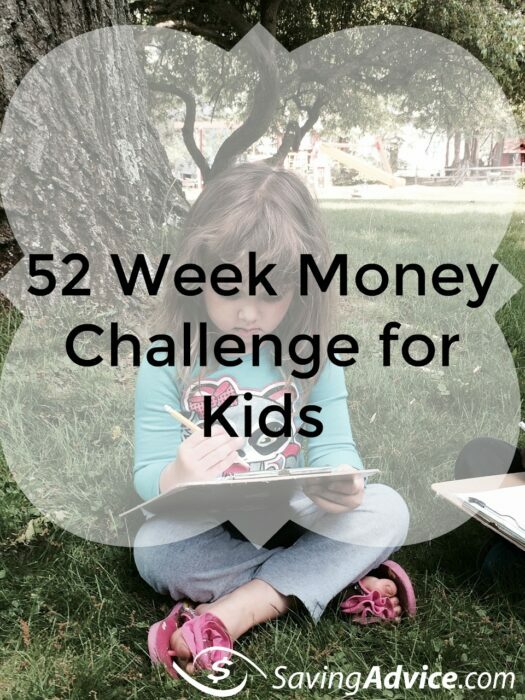 Taking a portion of the allowance each week and putting it toward this challenge will teach them that a certain amount should always be saved from the money that they receive. By having a specific amount that needs to be saved (or letting them choose the amount each week in the flexible version), you give them the opportunity to learn important money decision-making skills. Those who complete this challenge will end up with $68.90 in their bank at the end of one year. If you would like to print out the Nickel Challenge, you can download the PDF version or simply click on the image above to enlarge it. The above image can be enlarged with a click to print, or you can download this version in PDF format to print. The Penny Challenge is for those kids who are just beginning to learn how to count. Doing this challenge isn’t going to save much money as the grand total after a year with all the amounts crossed off only comes to $13.78, but that isn’t the main point with this one. The main point is getting a young child familiar with money and saving (and you can do some interesting things with the pennies you save), as well as giving them an opportunity to participate in a challenge like their older siblings to make saving money a truly family event. The PDF version can be downloaded to print, or you can enlarge the image above by clicking on it. We have also created a flexible version of the Penny Challenge for those who want to pick and choose the amount they save each week. The PDF file is available for download or the image above can be enlarged by clicking on it. If you start these challenges with your kids when they turn 4 and do the Penny Challenge for years 4, 5, 6, then the Nickel Challenge for years 7, 8, 9, 10, 11, move up to the dime challenge years 12, 13, 14 and then finish with the quarter challenge years 15, 16, 17, 18, your child will have over $2000 in the bank. While that $2000 is nice, it’s the process which is far more important than the actual amount the kids save. It gives them the opportunity to develop the important habit of putting small amounts to the side, no matter how little, each week. If you can instill this financial habit into your kids, it will greatly benefit them as they get older and it’s something they will surely be thankful you did for them. If you decide to do the standard dollar challenge while your kids are doing the coin challenge, it’s also a great way to teach your kids first hand and together about saving. For anyone who needs more motivation, we also have a small community of people doing this challenge supporting one another. Over the past few years there have been more applications designed to help people save money. One great savings app to install is digit.co. What the app does is analyze your savings account balances and then make withdrawals which are swept into a savings account for you. It is easy to install and once you activate your account saving become effortless. Digit does all the work for you. Check it out at digit.co.